Soccer—or football if you’re from anywhere else but the U.S.—is the most popular sport in the world. But what if it could be better? I mean...I’m not talking so much in the sense of fast-paced athletic play than I am grown up men making idiots of themselves with VR headsets. I’d watch that. 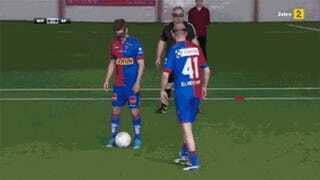 A Norwegian television show decided to conduct a little experiment to see what soccer would be like if players had to wear VR headsets that were all live streaming a birds-eye view of the game. The results are hilarious. It’s like if humanity survived the zombie apocalypse, and we just forced zombies to play soccer for our amusement. The video was originally posted on Reddit with some commenters picking out that the players were actually using VR headsets often used for first-person views of RC planes. This particular TV show also has a history of subjecting soccer players to all kinds of weirdness, including electric shock and inflatable bouncy balls. Update: So some killjoy killed this VR soccer delight on Youtube. Luckily, you can still enjoy people getting tased while playing soccer. Not a terrible substitute, really.